Gladys M. Pitzen was born on 25 November 1920 at Wisconsin. She was the daughter of Charles Pitzen and Mary Miller. Gladys M. Pitzen was the maid of honor at the wedding of Margaret M. Richter and Edward C. Pitzen on 8 October 1940. 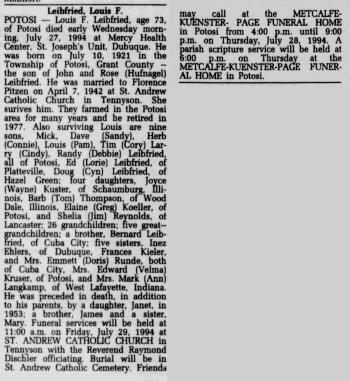 Gladys M. Pitzen died on 24 June 2001 at age 80. Married Name Her married name was Leibfried. Florence N. Pitzen married Louis Frederick Leibfried, son of John Bernard Leibfried and Roselinda Catherine Hufnagel. Florence N. Pitzen was born on 27 March 1924 at Wisconsin. Florence N. Pitzen died on 9 October 2006 at age 82 Florence P. Leibfried, 82, of Potosi, died Monday, Oct. 9, 2006, at Mercy Medical Center-Dubuque. Louis Frederick Leibfried married Florence N. Pitzen, daughter of Charles Pitzen and Mary Miller. Louis Frederick Leibfried was born on 10 July 1921 at Potosi, Grant, Wisconsin. He was the son of John Bernard Leibfried and Roselinda Catherine Hufnagel. Louis Frederick Leibfried died on 27 July 1994 at age 73 Louis F Liebfried obituary. Married Name Her married name was Pitzen. Marion M. Tracy married Frederick A. Pitzen, son of Charles Pitzen and Mary Miller. Marion M. Tracy was born on 11 September 1924 at Grant, Wisconsin. She died on 3 May 2000 at Wisconsin at age 75. Married Name Her married name was Klaas. Mary P. (?) married Elmer John Klaas, son of Herman John Klaas and Mary Magdalena Alt. Mary P. (?) was born on 3 January 1919. She died on 29 March 1994 at age 75. William Elliott married Amelia Kase. Married Name Her married name was Elliott. Amelia Kase married William Elliott. Married Name before 1950 As of before 1950,her married name was Klaas. Nellie M. (?) was born on 3 February 1915. She married Leonard Bernard Klaas, son of Herman John Klaas and Mary Magdalena Alt, before 1950. Nellie M. (?) died on 29 December 1950 at age 35. Alphonse Earl Roth was born on 16 May 1900 at Illinois. He married Caroline Klaas, daughter of Herman John Klaas and Mary Magdalena Alt, circa 1922. Alphonse Earl Roth died on 21 November 1951 at age 51. Russell Ziert married Elizabeth Mary Klaas, daughter of Herman John Klaas and Mary Magdalena Alt. Russell Ziert was born on 19 July 1904. He died in February 1987 at Florida at age 82. Warren Campbell married Lorraine Klaas, daughter of Herman John Klaas and Mary Magdalena Alt. Married Name Her married name was Foht. Rosella Mary Klaas married Vincent Foht. Rosella Mary Klaas was born on 11 June 1920 at Grant, Wisconsin. Rosella Mary Klaas died on 17 May 1978 at age 57. Vincent Foht married Rosella Mary Klaas, daughter of Herman John Klaas and Mary Magdalena Alt. 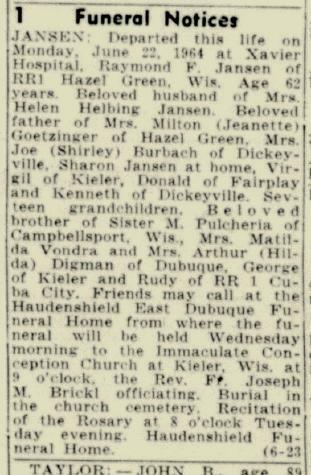 Married Name November 1929 As of November 1929,her married name was Jansen. Married Name before 1975 As of before 1975,her married name was Wiederholt. Helen Sara Helbing was born on 26 August 1911 at Potosi, Grant, Wisconsin, also reported as 02 Aug 1911. Helen Sara Helbing married Raymond F. Jansen in November 1929 Ray Johnson (Raymond Jansen) and Helen Helbing engagement announcement. Helen Sara Helbing married Hilary J. Wiederholt, son of Peter J. Wiederholt and Ann Wiegman, before 1975 at second marriage for both. Helen Sara Helbing died on 25 September 1999 at Cuba City, Grant, Wisconsin, at age 88. She was buried after 25 September 1999 at Immaculate Conception Catholic Church Cemetery, Kieler, Grant, Wisconsin. Ervin Helbing was born on 2 May 1913 at Wisconsin. He was the son of Anthony Adam Helbing and Christine Hentrich. Ervin Helbing died on 8 June 1987 at age 74. [S250] U.S. Federal Census 1930 U.S. Federal Census, by Ancestry.com, Year: 1930; Census Place: Paris, Grant, Wisconsin; Roll: 2574; Page: 4B; Enumeration District: 37; Image: 574.0. [S373] U.S. Federal Census 1940 U.S. Federal Census, by Ancestry.com, Year: 1940; Census Place: Paris, Grant, Wisconsin; Roll: T627_4481; Page: 1B; Enumeration District: 22-37. Name Variation Raymond F. Jansen was also known as Ray. Name Variation Raymond F. Jansen was also known as Johnson. Raymond F. Jansen was born on 29 April 1902 at Grant, Wisconsin. He married Helen Sara Helbing, daughter of Anthony Adam Helbing and Christine Hentrich, in November 1929 Ray Johnson (Raymond Jansen) and Helen Helbing engagement announcement. 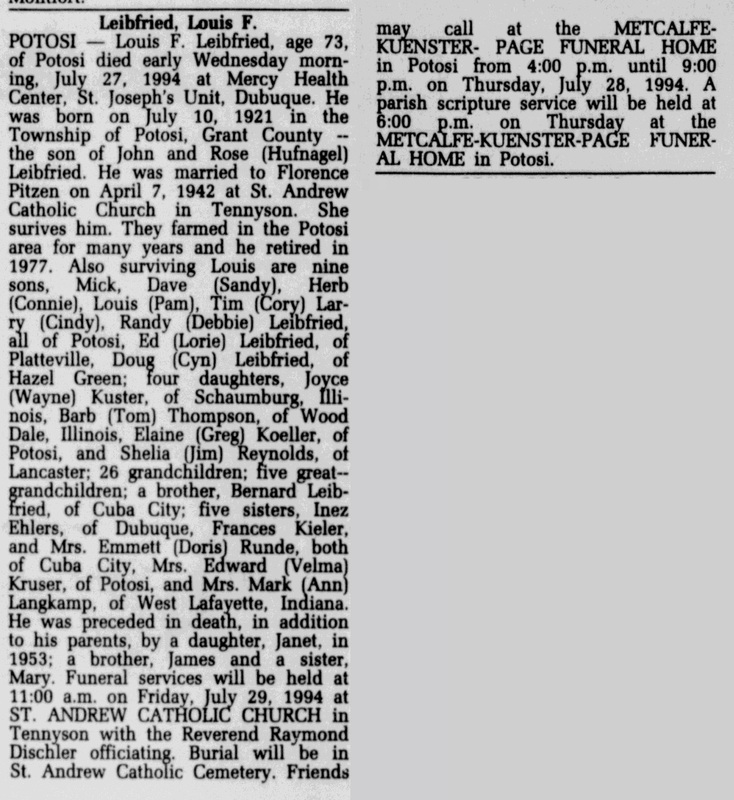 Raymond F. Jansen died on 22 June 1964 at Xavier Hospital at age 62 Raymond F Jansen obituary. Gertrude K. Uppena was born in May 1884 at Wisconsin. She was the daughter of Henry B. Uppena and Katherina A. Neiner. [S245] U.S. Federal Census 1900 U.S. Federal Census, by Ancestry.com, Year: 1900; Census Place: Potosi, Grant, Wisconsin; Roll: T623_1790; Page: 14B; Enumeration District: 51. Mary R. Uppena was born in January 1886 at Wisconsin. Name Variation Allice Uppena was also known as Allie. Allice Uppena was born in July 1887 at Wisconsin. Louis B. Uppena married Alberta Scanlan. Louis B. Uppena was born in December 1890 at Wisconsin. He was the son of Henry B. Uppena and Katherina A. Neiner. Henry F. Uppena was born in February 1895 at Wisconsin. Florence A. Uppena was born in February 1897 at Wisconsin. Joseph W. Uppena was born in March 1899 at Wisconsin. Harvey Leroy McKee was born on 25 March 1900 at Wisconsin. He was the son of Louis F. McKee and unknown (?). Harvey Leroy McKee married Mabel C. Pluemer, daughter of Adam Pluemer and Elizabeth S. Rupp, in 1924. Harvey Leroy McKee died on 27 March 1961 at Wisconsin at age 61. Gertrude C. Rupp was born on 4 April 1906 at Potosi, Grant, Wisconsin. She was the daughter of Anthony George Rupp Jr. and Mary Bertha Schaefer. Gertrude C. Rupp died on 18 April 1997 at Arizona at age 91. Gertrude C. Rupp obtained US Social Security Card at South Dakota; last residence Minneapolis, Hennepin, Minnesota. [S250] U.S. Federal Census 1930 U.S. Federal Census, by Ancestry.com, Year: 1930; Census Place: Wano, La Moure, North Dakota; Roll: 1736; Page: 2B; Enumeration District: 39; Image: 1052.0. Clara Rupp was born in 1908 at Grant, Wisconsin. Clara Rupp died in 1950. Married Name 17 November 1940 As of 17 November 1940,her married name was Metz. Leona J. Rupp was born on 27 September 1910 at La Moure, North Dakota. Leona J. Rupp married Charles Andrew Metz on 17 November 1940 at Brown, South Dakota. Leona J. Rupp died on 17 August 1978 at age 67. [S373] U.S. Federal Census 1940 U.S. Federal Census, by Ancestry.com, Year: 1940; Census Place: Jamestown, Stutsman, North Dakota; Roll: T627_3015; Page: 6B; Enumeration District: 47-31A. John Anthony Rupp was born on 1 December 1914 at La Moure, North Dakota. John Anthony Rupp married Mildred Elizabeth Dunn on 2 June 1942 at North Dakota. John Anthony Rupp died on 11 February 1992 at La Moure, North Dakota, at age 77. Married Name 2 June 1942 As of 2 June 1942,her married name was Rupp. Mildred Elizabeth Dunn was born on 28 October 1918 at South Dakota. She married John Anthony Rupp, son of Anthony George Rupp Jr. and Mary Bertha Schaefer, on 2 June 1942 at North Dakota. Mildred Elizabeth Dunn died on 1 September 2006 at Lamoure, North Dakota, at age 87. She was buried after 1 September 2006 at Mount Calvary Cemetery, Edgeley, LaMoure, North Dakota. Victor Rupp was born in 1918 at North Dakota. Victor Rupp was buried in 1936 at Mount Calvary Cemetery, Edgeley, LaMoure, North Dakota.